This is the time of year when snakes take advantage of sunny, mild days by basking in the sun and warming their bodies. It’s possible to come across basking Common Gartersnakes as late as November, as they are more cold tolerant than many species of snakes. All too soon, however, they will be retreating into their hibernacula (hibernation site), where they are protected from severe cold (being ectothermic, snakes cannot control their body temperature). To further protect them, a high level of glucose acts as antifreeze in snakes. 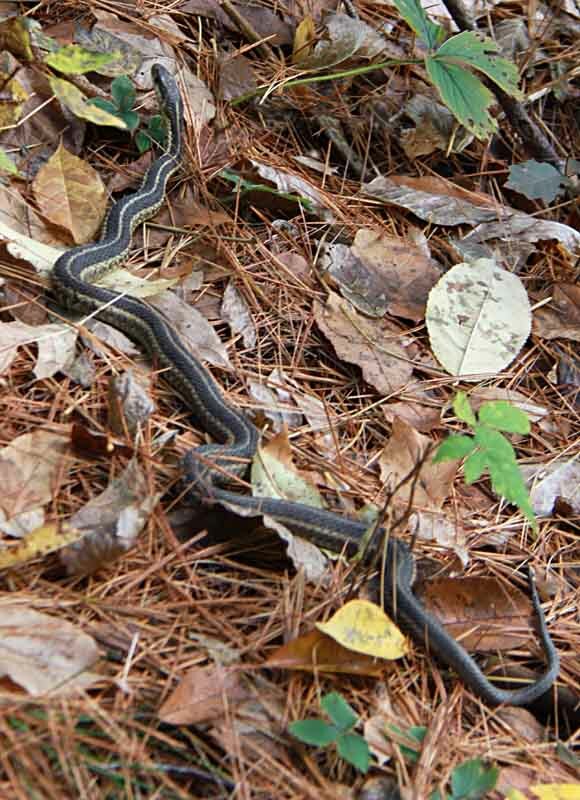 The ideal hibernaculum not only serves as a temperature buffer, but also conceals its occupant from potential predators, permits gas exchange, and prevents excessive desiccation. Rock crevices, abandoned woodchuck burrows, rotting tree stumps and old foundations are favorite hibernacula for snakes and other hibernating animals. Gartersnakes typically overwinter in groups, and some even share their hibernacula with other species of snakes, including Smooth Greensnakes, Ring-necked Snakes and Red-bellied Snakes. You can often tell whether a snake is active in the day (diurnal) or during the night (nocturnal) by looking at its eyes. 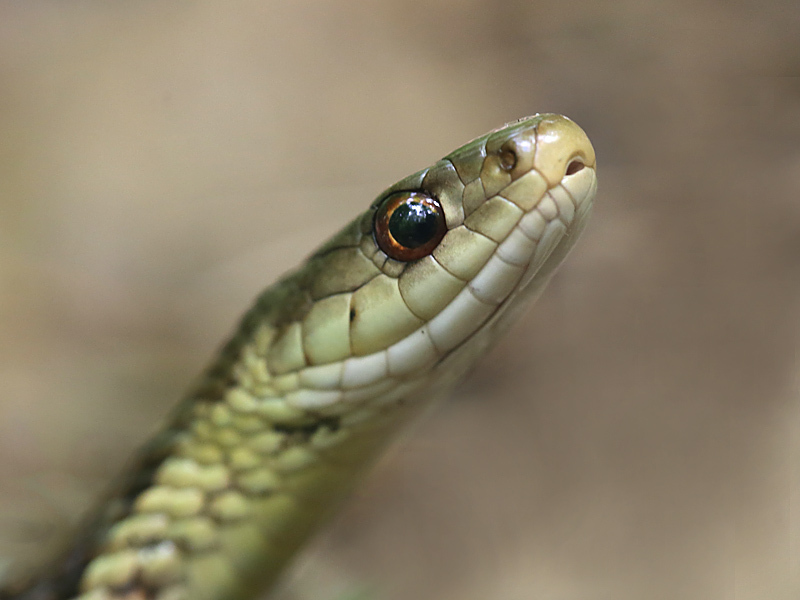 Diurnal snakes, such as the pictured Common Gartersnake, typically have round pupils and moderate-sized eyes. Many nocturnal snakes have large eyes and many also have vertical, elliptical pupils. A round pupil is able to close tightly to a pinpoint opening, allowing a minimum amount of light to enter the eye on very bright days. In contrast, a vertical pupil can open wider than a round pupil to allow more light to enter the eye, a useful adaptation for night vision. 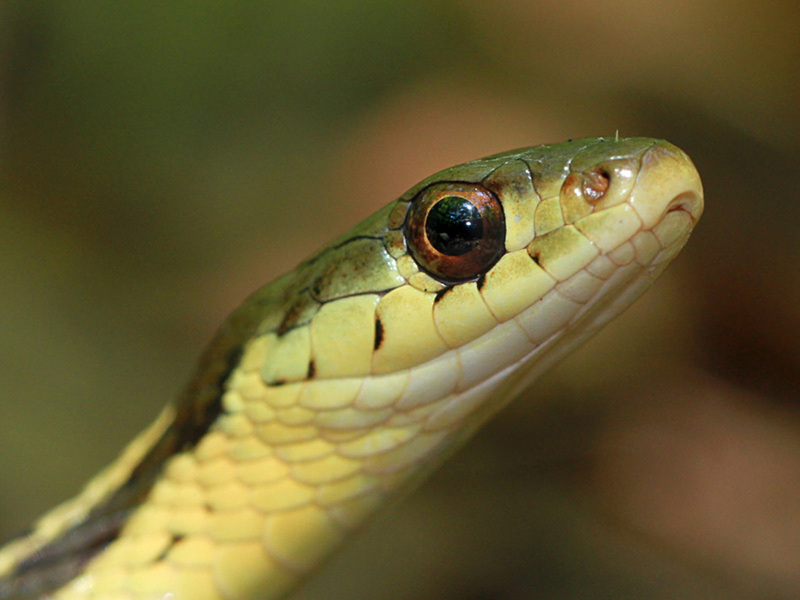 The Common Gartersnake (Thamnophis sirtalis) is New England’s most common and widespread snake. It’s not unusual to find one that has been run over on the road, but rarely have I found a carcass of one in the woods, especially this late in the year. Gartersnakes usually are hibernating (often in groups) in rock crevices, rotting logs or holes dug by mammals by October or so. The warmer-than-usual fall certainly allowed for extended basking in the sun and the ability to find active earthworms later in the season. If you look closely you may see that this gartersnake has a blue tinge where it’s normally a greenish color. Yellow and blue pigments in a snake’s skin fuse to produce the green color in living snakes. After death, the yellow pigment breaks down very quickly, whereas the blue pigment is more stable and remains much longer. 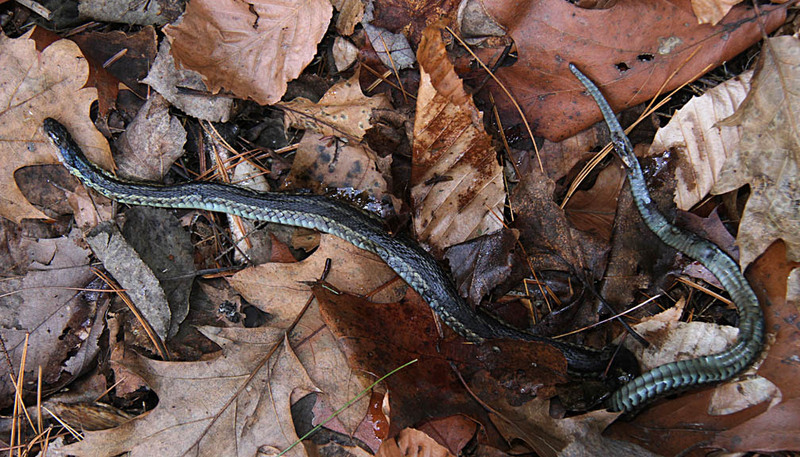 Gartersnakes that have been dead for a while can have bright blue dorsal and lateral stripes. Most species of snakes lay eggs (oviparous), but some give birth to live young (viviparous), including the common gartersnake (Thamnophis sirtalis). 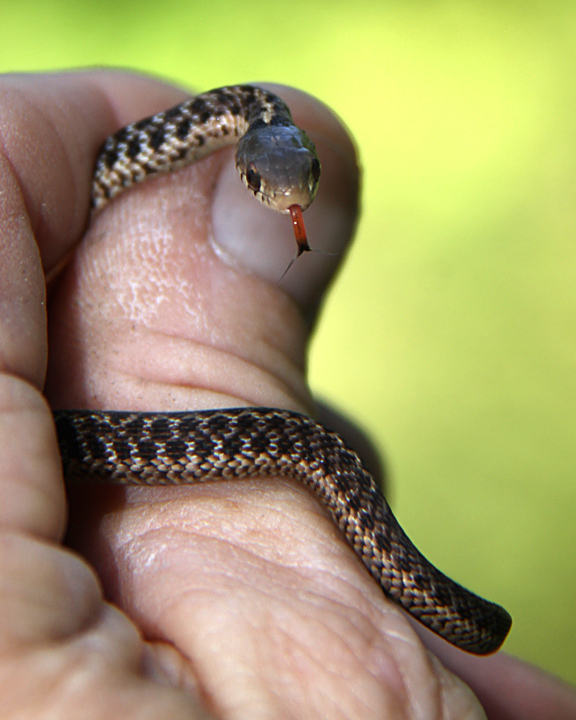 Gartersnakes are born at this time of year, and are on their own from the moment of birth. The greatest number of gartersnakes to be born in a single litter is 98, but 14 – 40 is more typical. 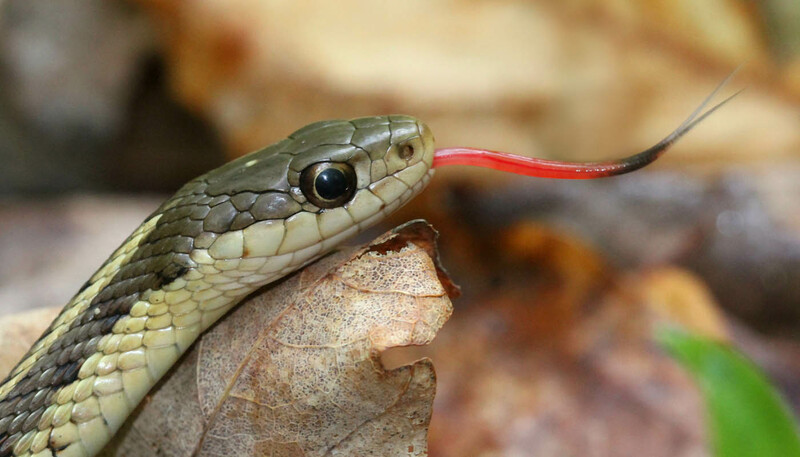 The common gartersnake in the accompanying photograph is a newborn, measuring 6 inches in length.